Mylan, the maker of EpiPen, says it will sell a generic version for $300 for a two-pack, a price that consumer advocates say is still too high. The device is used to treat severe allergic reactions. The company says the generic will hit the market in a few weeks and cost $300 for a two-pack. That's less than half the price of a two-pack of brand-name EpiPens, which are available at pharmacies operated by CVS inside Target stores for about $630, according to GoodRX. The move by Mylan comes in response to mounting pressure from consumers and Congress to lower the drug's price. In less than 10 years, the price for a two-pack of injectors has risen from about $100 to more than $600. 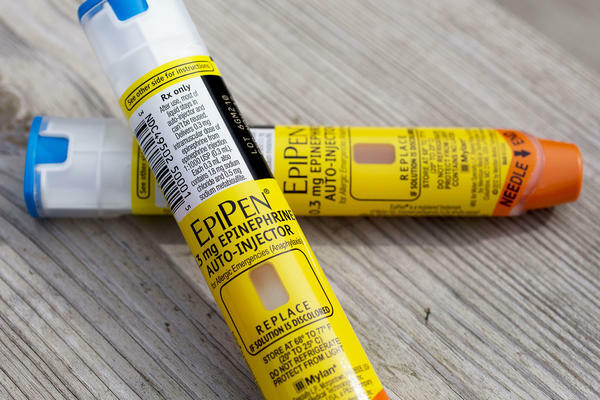 "This helps Mylan with its public relations battle against criticism for sharp price increases on the EpiPen," says Larry Levitt, a health policy analyst at the Kaiser Family Foundation. "The introduction of a lower-priced generic version may keep competitors out of the market." Mylan CEO Heather Bresch has spent the past week trying to shift blame for the increased cost of the product away from Mylan and onto insurance companies. The company argued that more people have high-deductible health plans and high copayments on medications now, so they are feeling the pain of price hikes more than they would have in the past. She repeated that Monday in a statement posted on the company's website. "Because of the complexity and opaqueness of today's branded pharmaceutical supply chain and the increased shifting of costs to patients as a result of high deductible health plans, we determined that bypassing the brand system in this case and offering an additional alternative was the best option," the statement read. But lawmakers and consumers didn't buy it. The anger over the price increases was directed solely at Mylan. "The weirdness of a generic drug company offering a generic version of its own branded but off-patent product is a signal that something is wrong," Robert Weissman, president of the consumer group Public Citizen, wrote in a piece published Monday by Huffington Post. "Mylan knows its $600 per set of EpiPens is unsustainable, but aims to continue ripping off some segment of the marketplace — both consumers who do not trust or know about the generic and perhaps some insurers and payers constrained from buying a generic. The announced $300 price for Mylan's generic also comes in too high; the profitable price in Canada is roughly $200 for two, and the price in France is roughly half that." He went on to write that the company's action "is just one more convoluted mechanism to avoid plain talk ... and just cut the price of Epipen." The frustration with the rising costs of the EpiPen has been brewing for months. But it exploded last week when activist parents of kids with allergies started a petition called "Stop the EpiPen Price Gouging" that automatically sends letters to members of Congress complaining about the rising costs. Almost 150,000 people have signed it, as of Monday. Several senators and members of Congress responded, asking the Federal Trade Commission to investigate whether the company's pricing policies violate anti-trust laws, and promising their own hearings on Capitol Hill. Mylan said Thursday it would offer discounts of up to $300 to offset consumers' share of the EpiPen's price. But that didn't quiet the criticism of the company. Democratic presidential nominee Hillary Clinton called on the company to lower the price "immediately." Mylan's latest move is meant to calm the anger of consumers and lawmakers, but it may also be a shrewd business decision. By bringing a generic to the market now, it could preemptively steal some market share away from Teva Pharmaceuticals, which is developing its own generic EpiPen. That device is expected to be approved in 2017. Mylan has a complex history with Teva, which last year tried to buy Mylan in a hostile takeover. Mylan was able to fight off the acquisition, in part, because it moved its legal headquarters out of the United States to the Netherlands. The maker of the EpiPen is bowing to public pressure. It plans to sell a generic version of the allergy drug for $300. That's half its current price. As NPR's Alison Kodjak reports, the public outrage could translate into lower prescription drug prices overall. ALISON KODJAK, BYLINE: EpiPens are used to stop life-threatening allergic reactions. Consumers have been growing angry as EpiPen's maker, Mylan, boosted the price for a two-pack from $100 to $600 in six years. Caleb Alexander is co-chair of the Center for Drug Safety and Effectiveness at Johns Hopkins in Baltimore. CALEB ALEXANDER: There's nothing that's forcing Mylan to produce a generic version of their branded product, but they're doing so because they argue that this is the best means of addressing the public outrage over the high cost of the EpiPen. KODJAK: The controversy is following a familiar cycle of outrage over the rising drug prices. Consumers complain. Lawmakers threaten hearings and new regulations, then the company backs down. Alexander says this incident could put the brakes on drastic drug price increases. ALEXANDER: I think we can only hope that this latest brouhaha helps force systemic change. KODJAK: He says companies may see that raising prices is risky to their reputations, or the Food and Drug Administration could speed up approvals for generic drugs in cases where prices are rising fast. Alison Kodjak, NPR News. Transcript provided by NPR, Copyright NPR. Should Naturopathic Doctors Be Allowed to Write Prescriptions? You've probably heard of MDs, medical doctors, but what about another type of physician: NDs? Naturopathic doctors now want to be allowed prescribing rights in Connecticut.